The features of Antonio de’ Medici are known from the likeness included by Alessandro Allori in the signed allegorical painting of Mercury and Argus now in the Fogg Art Museum, Cambridge Mass. He was nine years old at the time, and was to play a key role in the Medici dynasty, even though his real parentage remained always obscure. The three pictures that Allori painted of Antonio are a fascinating vignette of the key role he played in the Medici succession. He was claimed as the son of Bianca Capello and Francesco I de’Medici, mainly in response to the challenge that the Grand Duchess Giovanna d’Austria’s pregnancy in 1578 represented to this mistress of the Grand Duke, whose relationship with her was scandalous from the start. Giovanna d’Austria did in fact give birth to a male heir, Filippo de’Medici, and the whole invention of Bianca’s pregnancy might have rested there: but she saw the importance of ‘her’ son after the young Filippo died at the age of three, and the Grand Duchess herself died in childbirth in 1578. Bianca and Francesco de’Medici were united secretly in marriage only a couple of months later, celebrating in public only after a period of ‘official’ mourning in 1579. Since she had been a courtesan in Venice, and her husband before Francesco had disappeared in mysterious circumstances, their union was not popular in various sections of the Medici family, including the Grand Duke’s younger brother, Ferdinando de Medici, who had so far followed the allotted path of a career in the Church, becoming a Cardinal and looking after Medici interests in Rome. After Giovanna d’Austria’s death, however, the new Grand Duchess Bianca Capello revealed the existence of her ‘son’ with Francesco to the world, when Antonio was three years old, and after Giovanna’s son and the true heir of the Medici family died at the age of five, renewed her attempts to legitimate this offspring in order to consolidate her grip on power. Ferdinando however was determined that this event, which would have excluded him and dispossessed the family itself from the succession, should not occur. In October 1587 he arrived in Florence, in the company of the young Abate Francesco Maria Del Monte, who had for some time been his close aide and confidant (and later was to become Caravaggio’s great patron) and a couple of weeks later both Francesco and Bianca Cappello were dead, having suffered a severe and unexplained illness. Only in 2006[ii] was it revealed that their remains show that they were poisoned with arsenic, which was discovered in a forensic examination that demonstrated that this had been a lethal dose, rather than a habitual exposure -- something that could have been imagined as Francesco, for one, was very much involved in alchemy. Ferdinando withdrew from the glittering career in the Church to take up the Grand Duchy himself, but in his first two years in the title was very wary of what he ate, dining only in the company of Del Monte, whom he had raised to the purple a year later, in October 1558. 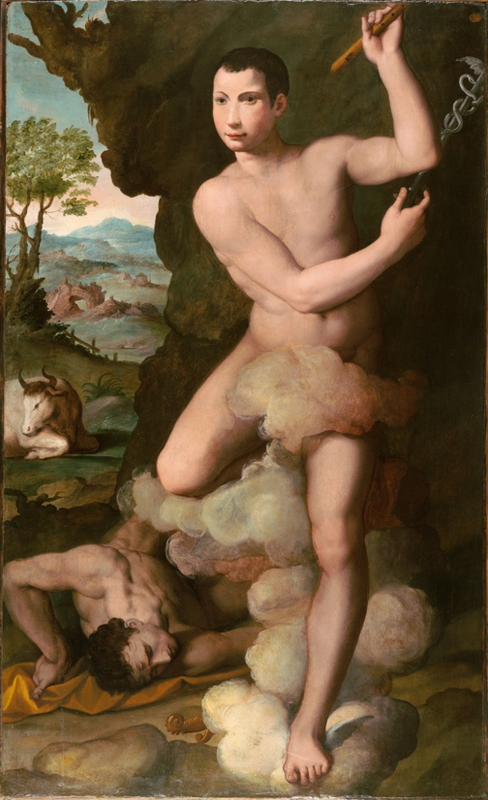 Antonio had, in the previous years, been much cosseted by his putative mother, and was already linked with the passion that Francesco I had for alchemy, which is doubtless why Allori was commissioned to paint the allegorical likeness of Antonio as Mercury, now in the Fogg Museum. The picture is signed on the front of the panel, and indeed the artist did a number of commissions for Bianca Capello at this period. These include the canvas of the Grand Duchess herself, with her son presenting her with a bunch of flowers, described in the archives and still in Florence in Palazzo della Crocetta in 1737: “una tela2 ½ x 2 ⅓ braccia con ritratto di Bianca Capello che dà [sic] un mazzetto di fiori a D. Pietro [sic] suo figlio”[iii] These are an indication that the young Antonio was already involved with ‘herbs and simples’ the study of which was such an important part of contemporary medicine in Florence. The double portrait had been delivered to the Galleria of the Grand Duke on October 6, 1587, according to the accounts left by the artist himself and quoted by Langedijk. Ferdinando, who by this exercise regained his inheritance of the Medici dynasty, took steps to deprive Antonio of his title, but gave him an honored position in the family, a pension of 3000 scudi a year, and on his majority in 1598, established him in the Casino di San Marco which was newly refounded as the Medici alchemical laboratory. It was a role of real significance in Florence at the turn of the century, especially as there was such a culture for alchemical medicine there, and a real position in society for a young man who was widely thought to have been the son of Bianca Capello’s chambermaid. Don Antonio (as he was known) gathered one of the most important libraries of alchemical literature in Italy. Both Ferdinando and his Grand Duchess Cristina di Lorena continued their passion for alchemical medicine, taking up the controversial ideas of Paracelsus, which would also be shared by Del Monte in Rome, when he established an alchemical laboratory on the Pincio in what later became the Casino Ludovisi. But Antonio was of course excluded from the Medici family succession, and died in relative obscurity in 1621. [i] A label on the verso of the panel reads “Sendung Florenz 12/4 1892.” According to Dr Joanna Winiewicz-Wolska of the Wawel Royal Castle Collection, and the author of Karol Lanckoronski and his Viennese Collection (Cracow 2014), “both the date and the place would indicate that the painting may have been purchased through the Florentine art dealer Stefano Bardini or that it was acquired at the auction of the Borghese collection in Rome; during that same year, Lanckoroński made numerous purchases at the auction and the purchased objects were systematically shipped to Vienna.” The portrait is not identifiable in the auction of works from the Borghese family held in Rome from March 28, 1892 on. A printed label, affixed to the former frame of the painting, headed “Eigentum Sr. Excell. des Herrn. Grafen Karl Lanckoronski” bears an inventory number 43. According to Dr. Winiewicz-Wolska, in the relevant 1895 of the collection that number corresponds to a vitrine, suggesting that the painting had left the collection by that time (Email of September 15, 2017). [ii] F. Mari, A. Polettini, E. Bertoi, ‘The Mysterious Deaths of Francesco I de’Medici and Bianca Capello’ British Medical Journal, 23 Dec. 2006, 333, 129-1301. [iii] Karla Langedijk, The Portraits of the Medici, (Florence 1991) I, p 317, which relates to a picture still unpaid for at the time of Bianca’s death in 1587. This is identified by Langedijk with a portrait of Bianca Cappello and Don Antonio, including the bunch of flowers, then cited as being in a private collection in Lima, Peru; the painting is in fact in the Dallas Museum of Art.